...brand new “little Lee” alongside our not so new Transport Manager “Big Lee” Evans. This smaller van is less that half the size of our standard Ford Transit at 110 grams per KM and will give us the flexibility to arrange smaller deliveries, more quickly, with reduced emissions. This is good news for our customers too. 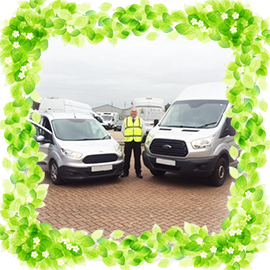 As we now boast a larger breadth of vans in our fleet, 16 in total, meaning more and more of our customer’s deliveries being made on our own vans.